People seem to either love Los Angeles or hate it, and in the past I’ve always been a bit overwhelmed by the seemingly endless snarls of freeways that run through it and the blonde, beachy beauties that inhabit it. But a recent weekend spent in Los Angeles visiting family revealed to me some of the highlights of living there: a beautiful beach, endless sunshine, great shopping … and food trucks! My perfect Los Angeles day began as my boyfriend and I met up with my cousin and her 18-month-old baby for a trip to Santa Monica Beach. The white sands stretched out before us as we trekked along, looking for the perfect spot. The beach was fairly empty since for Los Angeles the 75 degrees was a little chilly. I kept Baby Lila entertained by hauling buckets of seawater back to our picnic spot so that we could play in the wet sand together, methodically creating and destroying drip castles. Finally, I could resist no longer–the warm waves of Southern California’s Pacific Ocean called to me and I spent nearly an hour bodysurfing and splashing in the water. Next, finished with the beach, we took a long walk from Santa Monica Beach to Venice Beach, one of the most popular and scenic walks in Los Angeles. Though we were on foot (or in a stroller, in Lila’s case), many people whizzed by on roller blades or bicycles as we made our way along a concrete path lining the beach. Our arrival in Venice Beach was marked by stands hawking Bob Marley t-shirts and henna tattoos, beachfront shops selling surf-wear and plenty of ice cream places. We briefly explored the beautiful canals that give Venice its name, and then shopped our way back to where the car was parked in Santa Monica, ambling along Main Street and stopping in boutiques and quirky art stores. In between purchasing a pack of Big Lebowski playing cards at a toy store and trying on summer dresses at a boutique, we happened upon what must have been a budding reality TV star. She beamed at the camera following her around as she pranced down the street; later we saw her happily eating a cupcake for the (presumed) viewers at home. What an LA experience! 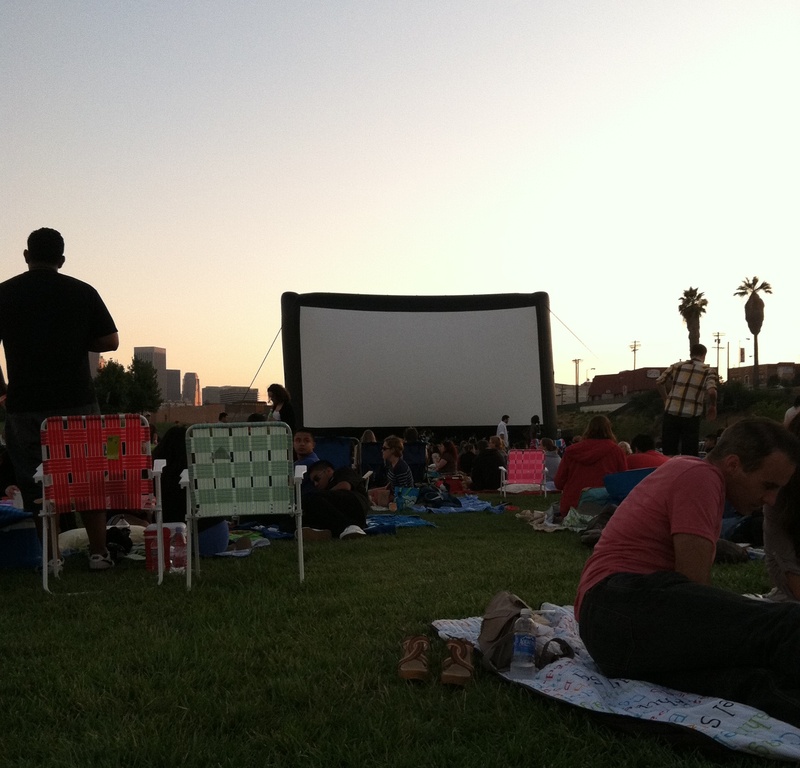 After a day in the sun, we were pretty drained, but we cleaned ourselves up, put on appropriately trendy outfits and headed out to Elysian Park for Los Angeles’ popular Outdoor Cinema Food Fest. Food trucks serving unique, gourmet food have grown in popularity around the US, even snagging their own reality TV show, but they were born in Los Angeles. 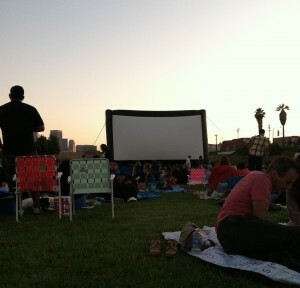 This festival was a great way to experience Los Angeles: we got to try Los Angeles’ own multicultural culinary invention, Korean tacos, and we got to see a classic movie, LA Confidential, projected onto an outdoor screen with the skyline of downtown LA in the background. Though full from all the food truck goodies, and tired out from a full day of fun, we had to make one last stop before heading home. We cruised by a few late-night Pasadena taco trucks before deciding on the one with the longest line. After a few tongue, brain and chorizo tacos scarfed down in a dark parking lot, we were ready to call it a night, but we resolved to return someday soon to Los Angeles for more fun! A weekend in Los Angeles is difficult without access to a car. If you don’t want to rent a car while you’re there, you can join tours that will transport you to all the famous sightseeing spots. California Tours offers a 3-day tour to Los Angeles from San Francisco that visits Hollywood, Santa Monica, Venice Beach, Santa Barbara and more. If you’d rather go on your own, staying in Universal City or Anaheim is a great choice for travelers with children, as these locations are walking distance from two great theme parks. 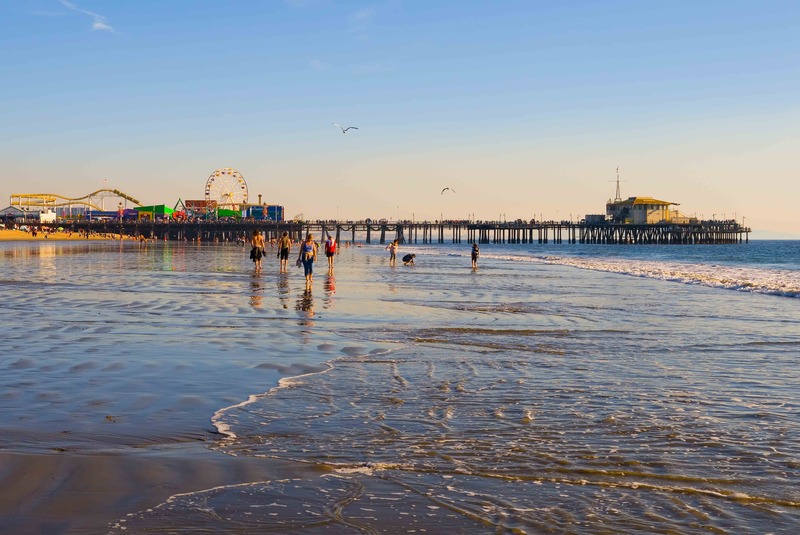 The Los Angeles airport area is the most budget friendly while still being centrally located, whereas staying in Santa Monica can get pricey. For more on loving L.A., check out Fall in love (or at least like) with Los Angeles on A Little Adrift! This entry was posted in California, Los Angeles and tagged Food trucks, Los Angeles, Santa Monica Beach, Venice Beach. Bookmark the permalink. I’m an LA native and I agree with your tour suggestions. 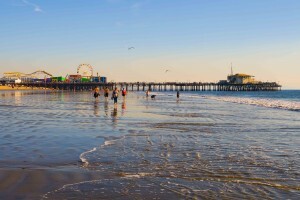 We go to the Santa Monica Pier every time we are in the area and never get tired of it. We love the people watching and sunny (if we are lucky) ocean air and the carousel among other delights. Thanks Karen! You’re right, the people-watching is the best part! Once every few months, my sister-in-law who lives in LA takes my 2 girls to Santa Monica Pier. They have so much fun playing at the pier. They get to eat, play games and go on rides (pier has rides for young children). My oldest daughter loves eating Korean tacos from Galbi truck! My girls call it a perfect day! That sounds so fun! I can’t wait for my baby cousin to get a little older so that I can take her on the rides too.